Julian Burroughs on the deck of the Wawee. See more images of Burroughs. 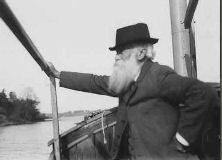 Julian Burroughs (April 14, 1878-December 15, 1954), son of famed naturalist John Burroughs, is noted in his own right as a landscape painter, writer, photographer, architect, and farmer. The only son of John and Ursula Burroughs, young Julian spent many hours with his father hiking and exploring their rural surroundings of Roxbury (Delaware County), N,Y., developing an appreciation of and curiosity about nature that would last throughout his life. John's interest in nature is evident in essays, sketches and photographs from his years at the Riverview Academy and Harvard. As a student at Riverview, Julian contributed to and served briefly as an assistant editor for The Riverview Student, the school's student publication; while at Harvard, he was a member of the Harvard Camera Club and sports photographer for a journal of photography. Julian also took advantage of the thriving social atmosphere around him, meeting many young women and men from prominent families, some of whom became life-long friends. Julian met his wife, Emily Dubois Mackay, during his senior year at Harvard. After a trip to Jamaica with his father in 1902, he and Emily married and moved to West Park, N.Y. and built a house at Riverby (property on which his parents had a house). Julian worked as a farmer (growing grapes and celery), Victor Talking Machine salesman, photographer, and writer of articles for Forest and Stream magazine while he and Emily raised their three children: Elizabeth (1903), Ursula (1905), and John (1909). In 1913, Julian moved his family to the estate of Colonel Oliver Hazard Payne at the colonel's request that Julian be superintendent of the property and staff while the colonel resided elsewhere. Using his architectural and carpentry talents, Julian designed and aided in the building of a number of buildings, gates, and a bridge on the Payne estate as well as his workshop, furniture, boat (The Wawee), and his house at Riverby. Although Julian's father encouraged him to spend more time writing and painting, Julian seemed much happier tending to his vineyards, photographing the local flora and fauna, woodworking, and spending time with his family. Julian gave lectures at meetings of the John Burroughs Memorial Association, served as senior warden of the Church of the Ascension in West Park, saw his children through college and begin their own families, entertained friends at his country home, and, in his final years, worked on his memoirs, which were completed posthumously by his daughter Elizabeth. Julian Burroughs died in the Kingston City Hospital at the age of 76 after several years of failing health. He was survived by his wife, three children, three grandchildren and a great granddaughter. The Julian Burroughs papers are comprised chiefly of letters, school books, essays, published and unpublished articles, lectures, and photographs relating to Burroughs academic life at The Riverview Academy and Harvard and later as manager of Colonel Payne's Estate. Many letters written to family and friends throughout Julian's life are also included here. There are many photographs, arranged chronologically, and including many vivid images in black and white of the West Park, NY area. Julian's studies at The Riverview Academy and at Harvard allow us a glimpse into the life of a student at the turn of the century. Report cards, assignments, exams, and text books give an idea of the curriculum for such private institutions of the era. Julian's letters from Harvard describe his social activity, academic studies and extra-curricular activities but the exact nature of the content of some of these letters is unknown since they were badly damaged in a fire at Julian's Riverby home in 1947. It is evident from the many readable copies that Julian described in some detail the new relationships he was forming with the young women in the Boston/Cambridge area, including what would be a lifelong friendship with Edith Trowbridge documented in their correspondence found in this collection. Also of note is the correspondence between Emma Larson and Julian while he was superintendent of Col. Payne's Estate in West Park, NY from 1913-1917. Emma Larson served as the Colonel's manager of household and was depended upon by the Colonel to convey his wishes concerning the running of the estate and architectural planning. The correspondence during Julian's four year stay involves plans for acquiring chickens, overseeing daily activities and the staff, and updates on each other's daily activities. The many lectures (1937-1953) given by Julian at the John Burroughs Memorial Association along with the slide show presentations written and presented by Elizabeth Burroughs trace the accomplishment and interests of both father's and son's involvement as naturalists. 10 Letters to Hugh, 1953? 3 Manuscript "Hudson River Grapes of Wrath"
4 Manuscript "Roughing It in Jamaica"
e.) "Boats and Romance of the Upper Hudson"
6 1 Four-part series from The Craftsman: "Boyhood Days with John Burroughs"
3 3 copies of "The Athlete, the Camera and the Newspaper"; "Photography and Football"
4 Slide show lecture notes given by Julian (April 15, 1943) "Babes in the Woods"
7 Julian's articles from the East Hampton Star, 1943, 1946,1948, copy of 1917 article "Making TNT"
8 Jamaica articles, Draft (copy) "Roughing it in Jamaica"
J. "Wood Pewee - July '47 - No the camera wasn't out of focus..."